Graphs may have additional Y axes to accommodate plotting results with incompatible scales. 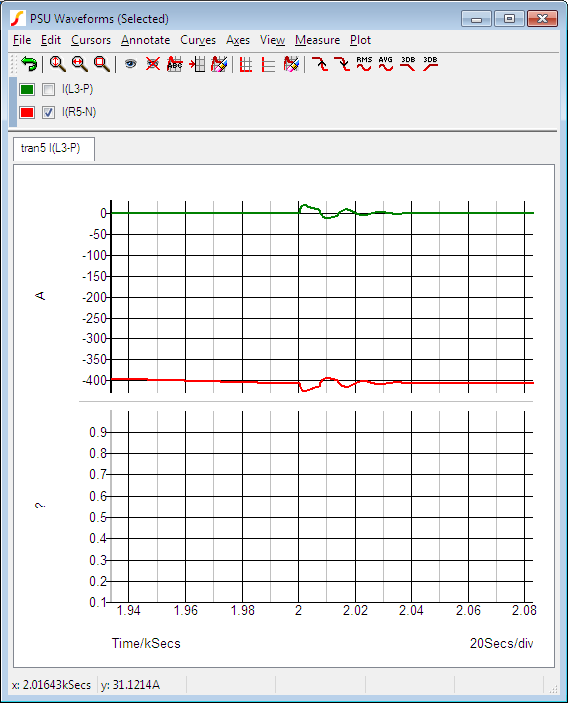 This occurs particularly for plotting dB and phase against each other and also for voltage and current. The additional Y axes may either be superimposed or stacked. In the user interface and the remainder of this documentation these are referred to respectively as Axes and Grids. These are illustrated below. If the currently selected axis or grid (shown by black axis line) has the same units as curve to be plotted or if it has undefined units (designated by a '?' on label), that axis will be used. If any other axis or grid has compatible units (i.e same as curve or undefined) that axis will be used. If no axes exist with compatible units, a new axis (not grid) will be created to accommodate the curve. Two toolbar buttons Create new grid and Create new axis allow manual creation of new axes and grids. These will be initially empty. Subsequent random probe operations will use the new axis or grid unconditionally as long as it remains selected (see below). Some operations are performed on the selected axis or grid. The selected axis or grid will be displayed with its vertical axis line a deep black while the remaining axes and grids will be light grey. Newly created axes and grids are always selected. To select an axis, click the left mouse button immediately to the left of the vertical axis line. The menu Curves > Stack All Curves will place each curve on its own grid. The menu Curves > Stack Selected Curves will place each selected curve on its own grid. Select the curve or curves you wish to move by checking its checkbox next to the coloured legend which designates the curve. Press the Move selected curves to new axis button. The curves will be re-drawn on the new axis. Any axes that become empty as a result of this operation will be deleted unless it is the Main axis. See Deleting Axes. If you attempt to delete the selected axis (the lower one), nothing will happen. Instead you should move the two curves in the top axis to the lower one. See above section on how to move curves. 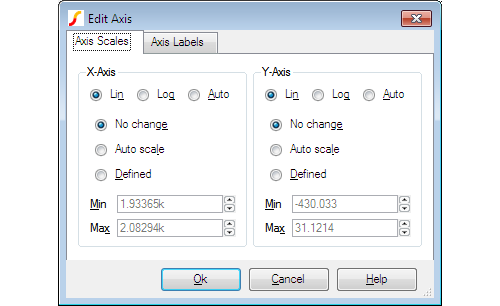 You can edit axis scales, label and units by selecting the graph popup menu Axes > Edit Axis.... 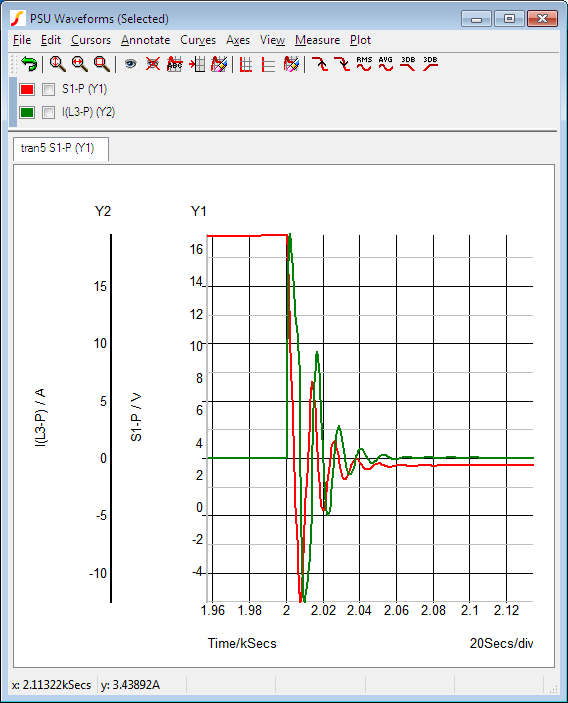 This brings up the following dialog box: The function of the Axis scales sheet and axis labels sheet is similar to the sheets of the same name in the define curve dialog box. See Plotting an Arbitrary Expression for details. Note that the main axis (the one at the bottom) cannot be moved. Rearrange entries in list as described above for analog grids.